Mount Vernon, NY, October 1, 2018 – Wartburg’s Chairman of the Home Operations Board of Directors, Rev. Amandus J. Derr, was recently named a Trustee of the Year by LeadingAge NY, an association of 5,600 not-for-profit organizations dedicated to advancing policies, promoting practices and conducting research that supports, enables and empowers people to live fully as they age. A board member since 2008, Rev. Derr began his career mowing the law at Wartburg as a seminary student. Fast forward 40 years and he is now Chairman of the Board and actively involved in all Board committees and the implementation of Wartburg’s strategic vision. Rev. Derr is the Senior Pastor of St. Peter’s Lutheran Church in New York City. A thriving community of committed staff, volunteers and parishioners, St. Peter’s offers a weekly soup kitchen, an active senior center, a robust art and jazz program and holds support groups for those recovering from addiction or living with diseases such as Aphasia. “I serve on the Wartburg Board because Wartburg, its Board members and its staff, function with the same values of justice, compassion and equal treatment for all, that I believe, teach and preach as a pastor in Christ’s Church. Wartburg embodies Christ’s mission in the world for the people we serve,” said Pastor Derr. Rev. Derr is often seen on Wartburg’s campus visiting residents, providing comfort and spiritual care-always with a ready smile and kind word. Wartburg congratulates Rev. Derr on this distinguished honor and thanks him for his dedication to ensuring that all those entrusted to Wartburg’s care live their best life. Wartburg, located in Westchester County, NY, offers integrated, comprehensive senior residential and healthcare services. Unlike conventional retirement communities, Wartburg provides a wide range of services to both residents living on its beautiful 34-acre campus and people in their own homes. From independent, assisted living and award-winning nursing home care to inpatient/outpatient rehabilitation, home care and adult day care services, its continuing care approach has earned Wartburg a trusted reputation in Westchester. Wartburg also provides caregiver support at every stage with an array of options to find the level of care that considers the whole family. Wartburg was named one of the “Best Nursing Homes in New York State” by U.S. News & World Report for the eighth consecutive year in 2018. 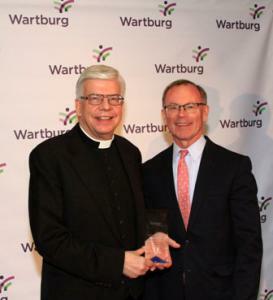 In addition, Wartburg received the 2016 Eli Pick Facility Leadership Award from the American College of Health Care Administrators and the 2015 Legacy Award from the Westchester County Chapter of the Links.